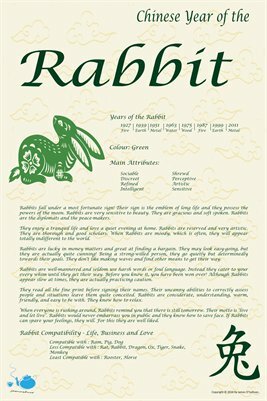 Years of the Rabbit: 1927 - 1939 - 1951 - 1963 - 1975 - 1987 - 1999 - 2011. Rabbits fall under a most fortunate sign! Their sign is the emblem of long life and they possess the powers of the moon. Rabbits are very sensitive to beauty. They are gracious and soft spoken. Rabbits are the diplomats and the peace-makers.